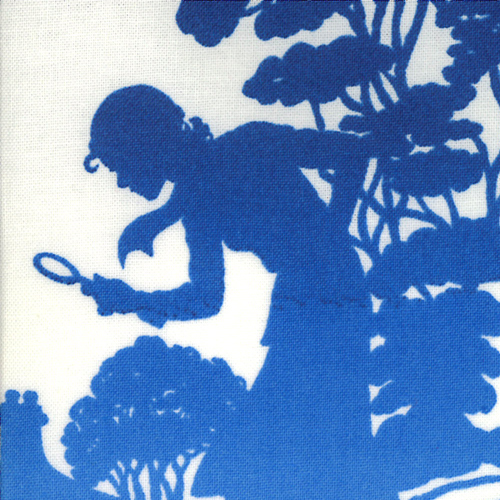 In days gone by there were just a few role models for independent girls, and one of them was Nancy Drew. Millions of girls (and a few boys) spent hours reading Nancy Drew mysteries and imagined themselves as creative, plucky problem solvers with loyal friends like Bess and George. There was something comforting about Nancy—despite doing what her Dad didn’t want her to do and involving herself in risky scenarios, she could be counted on to come out on top. 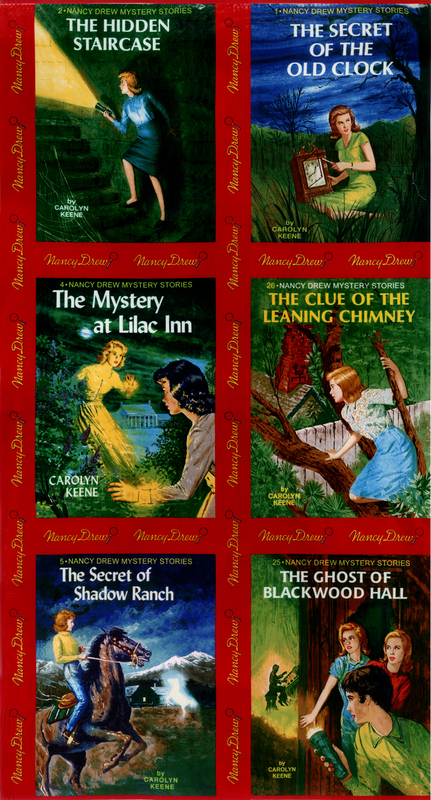 Even as more opportunities opened up for women, Nancy Drew held a special place in our hearts: in the 21st century, she was the subject of popular pre-teen movies, and 80th anniversary editions of some of the oldest books—first published in 1930—were reissued. 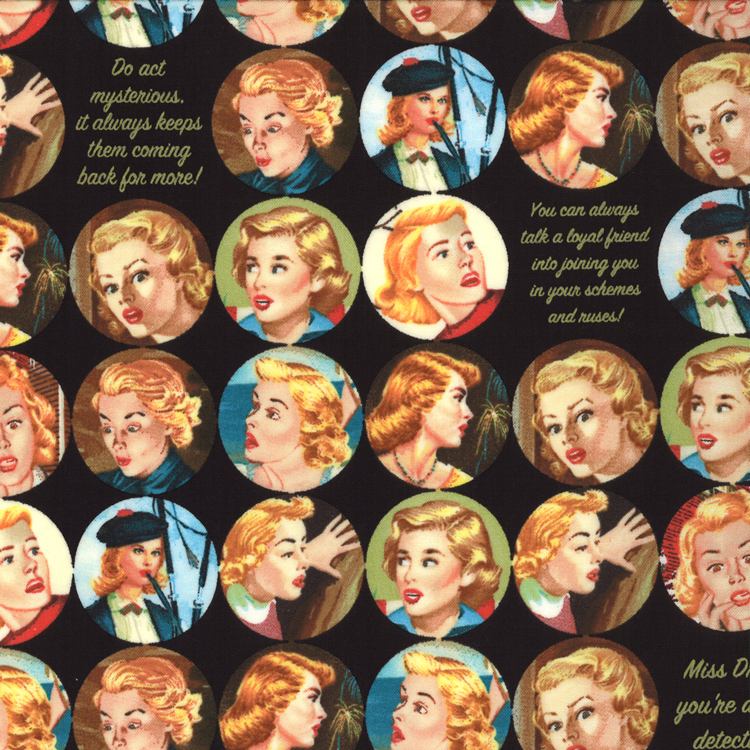 And now Moda has made Nancy Drew-lovers even happier, with Get a Clue, Nancy Drew, a line of fabric that reminds us of all we love about our stout-hearted heroine. I was a Nancy Drew fanatic as a girl and loved to read and re-read the volumes I had lined up (in order) on my bookshelf: The Hidden Staircase, The Clue in the Diary, The Mystery of the Tolling Bell. 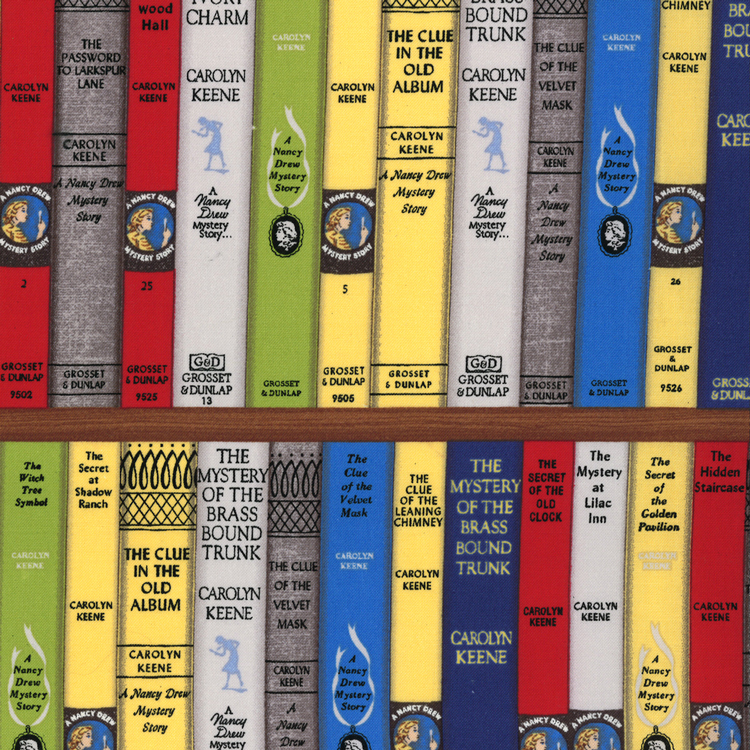 I fell even more in love with the books when I learned that the name of Nancy Drew author Carolyn Keene was actually a pseudonym, and that I had something in common with author Mildred Wirt Benson, who penned 23 of the first 30 Nancy Drew books (including the first seven). Just like Mildred, I earned a master’s degree in journalism at the University of Iowa—she, however, got hers in 1927 and was the very first student, male or female, to do so. Though Mildred Wirt Benson didn’t conceive of Nancy Drew—credit for that goes to Edward Stratemeyer—she did flesh Nancy out, making her a smart, inquisitive young woman with a sparkle in her eye and a blue roadster. Mildred was only 24 when she wrote the first Nancy Drew book The Secret of the Old Clock, for which she was paid $125. 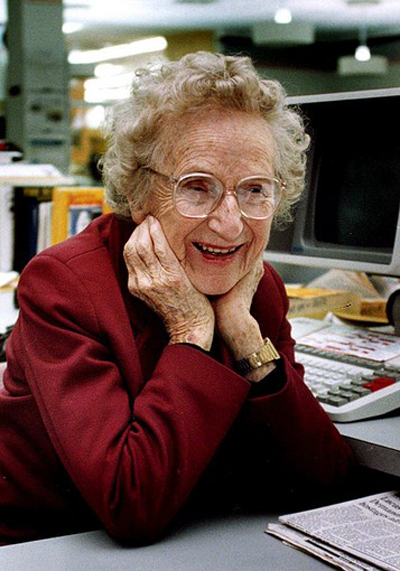 A plucky character in her own right, Mildred went on to write for a number of newspapers and spent the last 58 years of her career at the Toledo Blade, where she worked on a monthly column right up to her death in 2002 at age 96. I, personally, can’t wait to honor Mildred by stitching up a Nancy Drew bag or quilt! How about you? Did you, too, read Nancy Drew books by flashlight, under the covers, long after your parents told you to go to sleep? What are you planning to make with Get a Clue, Nancy Drew? Oh my word, oh my word, OH.MY.WORD!!! I would so love to make a huge quilt with the entire line. The book covers & spines with their reminiscent artwork bring back sooooo many tween-y memories! If you are a Nancy Drew lover, check out http://mychellem.blogspot.com/. Michelle has tutorials for a Nancy Drew quilt and for a Kindle cover. They are SO cute!! Ahh I am so ready to get some of this fabric! I was so excited when I saw that they were coming out with it! I am 21 years old and I still like to pull out my Nancy Drew books! 😀 I’m just not sure what I’ll make with the fabric yet! I loved Nancy Drew! And I still have all my books (some of which were my Mom’s). I look forward to reading them with my daughter. I will be keeping an eye out for this fabric line. When I was in elementary school and we went to the library at the school, I FLEW to the Nancy Drew books and checked them out. I reread many of them several times. They were such great stories. Nancy Drew is a classic! Nancy Drew was favorite in school. I grew up in 70s and 80s in India. Indian summers are quite the thing and I’d read and re-read all my Nancy Drew stories all through Summer. Keeping company to Nancy Drew books were Enid Blyton and Hardy Boys. Miss those simple beautiful summers! I am so in LOVE with this line! Is there any chance of a reprint of it? 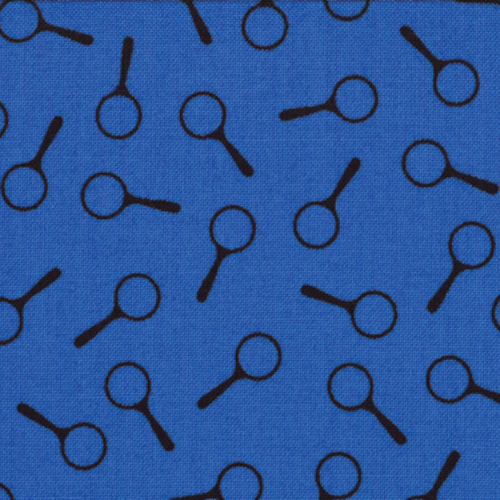 I would love yardage of a few prints that I haven’t been able to find anywhere. Please for those of us who weren’t lucky enough to get it the first time give us another chance.